Foreword. Preface. 1. Theory of surface tension. 2. Axisymmetric menisci and Laplace formula. 3. Methods for measuring surface tension of liquids based on studying profiles of menisci with fixed shape. 4. Methods based on measuring extreme values of parameters of menisci. 5. Methods using menisci at stability limit. 6. Special dynamic methods. 7. Methods using rotation field. 8. Methods to determine surface tension of solids. References. Subject index. List of principal symbols. 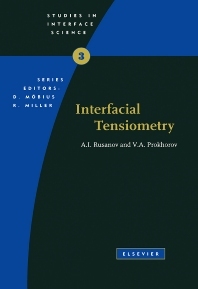 This is the first monograph devoted to interfacial tensiometry and is therefore the definitive source of information on measuring surface tension. More than 40 methods for measuring surface tension both at the liquid-fluid and solid-fluid boundaries are described including methods using computational techniques, tele- and video-apparatus, and laser techniques. A central place in the book has been given to methods based on the investigation of properties of liquid and gaseous menisci both in the presence or absence of a gravitational field and a rotational one. Their description is preceded by a chapter on the theory of menisci including the derivation of various forms of the Laplace formula. The application of the methods for studying the equilibrium and dynamic surface tension has been considered. Dynamic methods used for very small surface life-times are described and a separate chapter is devoted to the theory of surface tension which will ensure a better understanding of the material. A systematic analysis of the material embracing all kinds of interfaces including solid surfaces, the history of each method, its theoretical foundation, characterization of measuring procedures and setups, a large number of numeric tables and plots and representative illustrations make the book encyclopedic in character.